With more than 2,000 inhabited islands among a total of 7,000, the Philippines are a natural location for a ferry business. Until the 1990s, the Oceanjet’s parent company was in the business of barging heavy cargos between islands, but an opportunity to purchase a fast ferry started them on another path. 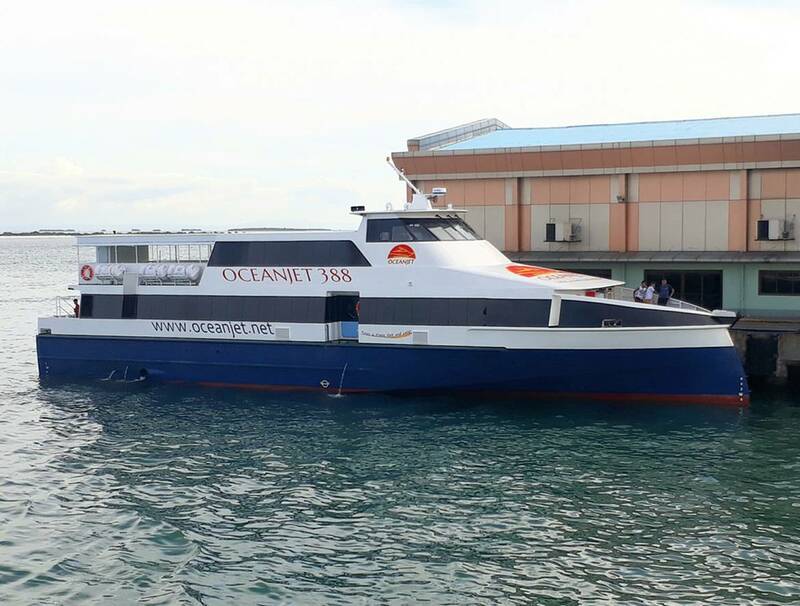 With the purchase of Ocean Jet 1, their first ferry, the company began the steady process of growth for their ferry operation from their base in Cebu. Although operating a fleet of fast ferries requires a different skill-set than a fleet of tugs and barges, the company now renamed Ocean Fast Ferries Corporation, has ticket offices and routes serving ten destinations. Growth has continued so that they are now operating a fleet of 18 vessels. Some years ago, the firm’s management made the decision to have a vessel designed and built specifically for their routes and the needs of their clientele. To this end they had Global Marine Design of Australia develop a 33.99 by 7.2-meter vessel with a capacity for 357 passengers. The design proved to be a great success. In January of 2018, the company took delivery of the seventh in the series. Built by the Golden Dragon Fastcraft Builder, Inc. of Mandaue City, Cebu the Oceanjet 388 will, like her sisters, carry 40 of her passengers in a first class cabin. Like the Oceanjet 88, commissioned in May of 2013, the Oceanjet 388 is powered by a pair of Cummins KTA50-M2 engines each developing 1800 HP at 1900 RPM. The engines turn 1221 by 1360 mm propellers through ZF 5050A gears with 2.467:1 reductions. This power gives the new vessel a 30-knot design speed. It will operate on a route between Tagbilan, Bohol and Cebu.